Are Luis Manzano and Jessy Mendiola getting more serious in their "relationship?" 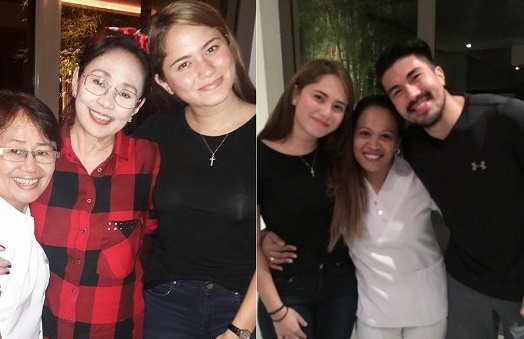 A photo of Jessy together with Luis' mom, Star for All Seasons and Batangas Rep. Vilma Santos-Recto has been circulating online. Apparently, Luis brought Jessy to their house in Alabang last July 17, Sunday to have dinner with his mom. Aling Fe, who works for the 'Recto's, and the one who posted the photo on Facebook, confirmed to a friend that she was with Lucky and Vilma because they had dinner at their house the previous day. She was also the one who posed with Jessy and Ms Vilma Santos on the said photo. Also check out when the "spark" between Jessy and Luis possibly started. Was Jessy really the cause of the breakup of Luis and Angel Locsin? Make sure to watch up to the end of the video to get the answers.